Essential to optimal well-being, the B-vitamins, being water soluble, are continuously being absorbed and used up by the body. 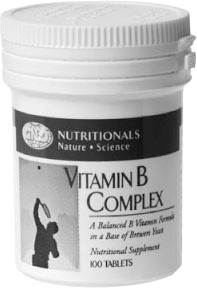 All natural B-Complex is formulated with a balance of B-vitamins. The natural potencies are protected by GNLD’s exclusive coating. All the nutrients are balanced in a base of brewer’s yeast. All B-vitamins are water soluble substances that can be cultivated from bacteria, yeasts, fungi or moulds. The known B-Complex vitamins are B1 thiamine, B2 riboflavin, B3 niacin, B5 calcium pantothenate, B6 pyridoxine, B12 cyano-cobalamin, biotin, choline, folic acid, inositol and PABA para-aminobenzoic acid. Delivery of a family of B-vitamins maintains the highly interrelated function of these vitamins within our bodies. Take one or two tablets per day as a Dietary Food Supplement.